Defender Michael Keane doesn’t see any reason why the Clarets can’t upset the odds on his return to Old Trafford. The 22-year-old, who made his loan move from Manchester United permanent last month, spent over a decade with the Red Devils where he developed through the club’s academy based at the Aon Training Complex in Carrington. But, despite his lengthy association with the 13-time Premier League champions, Wednesday evening will only be the second time the England Under 21 international has played a competitive domestic fixture at the Theatre of Dreams. Keane was handed two Capital One Cup starts by Sir Alex Ferguson and a substitute appearance in the same competition with the defender’s only outing on home soil coming in a 2-1 win over Newcastle United in September 2012. Keane, who made his last appearance for United in the 4-0 Capital One Cup hammering against MK Dons earlier in the season, said: “I’m really looking forward to it. It’s going to be a bit strange for me but we’ll go there looking for a win. “There’s no reason why we can’t. We’ve shown in previous games that we can play against the biggest teams in the league so we’ll go there on Wednesday night and go again. “I don’t think I have a point to prove. I was disappointed that I didn’t get as much game time there as I thought I might have and I was a bit unlucky there as well so there’s not really a point to prove. I want to do well and I want to show them what I could’ve done if I had played there. “I’m looking forward to seeing some of the younger lads. I’ve been with some of them since I was 10 years old as well as the coaching staff. 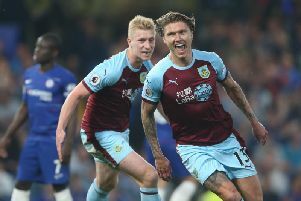 Keane, who has now made 14 starts for the Clarets in all competitions, believes his team-mates can take heart from recent performances against the league’s elite ahead of the upcoming cluster of fixtures. “We take massive confidence from them,” said Keane, who made his debut in the top tier under new United boss Louis Van Gaal when replacing close friend Chris Smalling in the 44th minute of a 1-1 draw against Sunderland at the Stadium of Light. “It’s not just the City game, there was also the game here against Liverpool. Some of our best performances have come against the bigger teams.